Cook bacon in a skillet until crispy, remove from grease and add to the cauliflower. Pour out all but 2 tablespoons of grease. Once the cauliflower is done, spoon it into the pumpkin and place it on a cookie sheet. Return it to the oven with the lid on for another 15-30 minutes (make sure the oven shelf is low enough so the stem isn’t touching the burner). Remove the top after 15 minutes and remove from oven if cauliflower is done or cook another 15 minutes with lid off until done. Butter makes everything better! You could substitute it with ghee as a dairy free option or increase the milk to 1/3 cup from 1/4 cup. 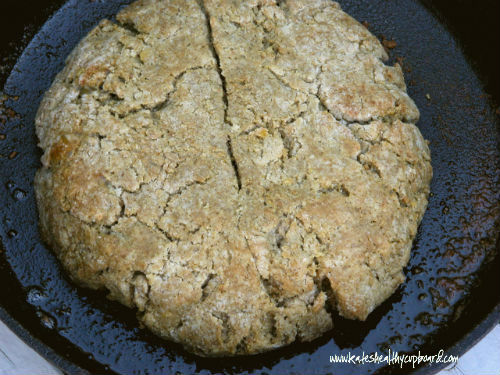 The original recipe calls for bread crumbs or rice. To make this with rice, sub the cauliflower with 2 cups of uncooked rice, use 1/3 cup milk and cook the entire dish inside the pumpkin from the start for 60-90 minutes with lid on. Remove lid the last 15-30 minutes and cook until rice is done (Directions in link above for original recipe). Holiday baking season is here!! My favorite place to order all of my nut flours, nuts, chocolate, dried fruit, etc is www.nuts.com. They have every kind of nut flour out there that is finely ground and sure to make your grain free baked goods perfect! They are certified gluten free so there is absolutely no cross contamination!! Baking wouldn't be the same without a sweetener, but I prefer to use a sweetener that won't raise insulin levels, is natural, won't upset your belly and won't leave you feeling guilty! Swerve is my go to...and you can enjoy 10% off as one of my readers with coupon code KATE10! Summer is here....hence why I have been absent in the kitchen lately. I am trying to get outside more and get off of the computer. Don't worry, I still have lots of recipes in the pipeline! This recipe is inspired by a recipe from The Joy of Cooking, one of my favorite cookbooks. The original recipe was made with jasmine rice, but I chose to make it with cauliflower "rice" and loooooved how it turned out. I could have eaten the entire head of cauliflower! Remove from heat and discard the pieces of ginger, add in the salt. Do not add it beforehand, it pulls water out vegetables. This could easily be sweetened with something like Swerve and reduce the amount of salt to make it a sweet treat. 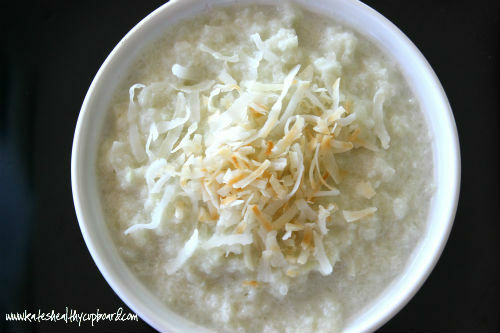 Another idea is to add protein powder of choice and eat it like a hot breakfast cereal (maybe even add some grass-fed butter). You could also do something similar to my Pumpkin Spice Cream Of "Wheat Recipe and add in eggs. Some of you may make the same menu every Thanksgiving, and others like to switch it up a bit. I am sure we all have our staples of turkey, mashed potatoes and gravy, sweet potatoes and what ever else is a family favorite. Here is an idea for any of you looking for a new idea for a vegetable to serve. It includes bacon, so it's sure to make everyone go after a second helping...except those vegetarians out there!!! I have quite a few recipes to get out before the holiday, so I am going to keep it short and sweet in my upcoming posts. I have a fantastic muffin recipe coming that is perfect to include in your breakfast on Thanksgiving morning and a pumpkin tart dessert for anyone looking to do something different than a traditional pumpkin pie!! I found myself going back for more of this...it's that good and such a different way to fix brussels sprouts. I think this would also be good with cabbage if any of you are not sprouts fans. Have you ever taken left over mashed potatoes and made potato pancakes the next day? I loved them, but no more potatoes for me so these "notato" pancakes made with cauliflower will have to do...and they do! If you eat white potatoes regularly, these may not do it for you and your starch addiction. Otherwise, give these a try and let me know what you think! 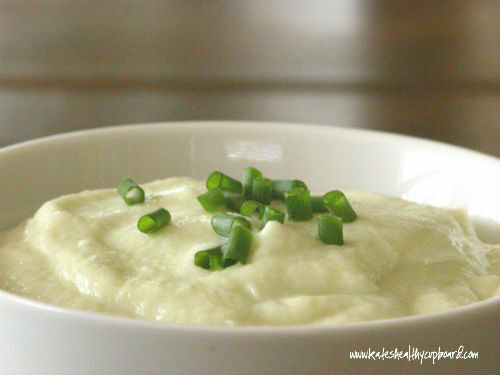 You may also enjoy this Mashed Cauliflower Recipe next time you're craving mashed potatoes! In a food processor, pulse the cauliflower into tiny pieces. Do not puree it! If your batter seems too running, add a bit of coconut flour if you’d like. I prefer these to be flourless! I am sure many of you have heard of this idea or already serve cauliflower this way. I have never tried doing this, not a big cooked cauliflower fan, more of a broccoli girl. All I can say...why did I wait so long to do this!!! It really does remind me of mashed potatoes. I haven't had white potatoes in a very long time, so someone that lives on them may disagree with me! This is a great starch free side dish to enjoy with out the guilt! If you are someone that is skipping over this recipe because this is old news to you, just wait, I have a unique one coming that uses this as a base!! Place the steamed cauliflower, butter, garlic, milk and salt and pepper in a Vitamix or high speed blender and blend until smooth. Pour into a bowl and stir in the chives and additional salt and pepper if needed. There are many variations to this recipe. Crumbled bacon would be good on top and you can also substitute the chives for green onion if you prefer. This is my favorite way to fix string beans. You can find them as the traditional green bean and also as the rare yellow string bean. I typically only see the yellow at the farmers markets, but was lucky enough to find them at the Whole Foods in Scottsdale. I'm not sure what, if there is any, the difference is between the two. I do know they taste a bit different. I think the yellow are less beany tasting, less vegetable tasting. I don't know how to describe the difference. I prefer the yellow, but seem to think the green might be better for me. Green beans are much easier to find so I will be sticking to those until some yellow beans pop up at this years farmer's markets. St Patrick's Day is coming up and cabbage is on the menu! I'm sorry I don't have a Irish potato soup recipe or soda bread. I do have an easy way to fix cabbage that can be enjoyed, Irish or not. I love roasted brussels sprouts and I think this has a little bit of a similar taste to it. That is probably because brussels sprouts are a type of cabbage. The different varieties are: Green, Savoy, Red, Napa, Bok Choy and Brussels Sprouts. Cabbage can be enjoyed raw in salads and slaws, braised over low heat, quickly cooked in stir-frys. Cabbage mellows and sweetens the longer it's cooked. Cabbage ranks right up there with broccoli, cauliflower and brussels sprouts with the reputation of fighting cancer. It's also a good source of vitamin C, Fiber, potassium and other nutrients.